The New World Center sits in Miami’s South Beach neighborhood and is a top venue for music education and performance. Designed by Frank Gehry, the concert hall is home to the New World Symphony and includes state-of-the-art technical capabilities. Yasushisa Toyota designed New World Center’s acoustics, working with Gehry previously on the Walt Disney Concert Hall in Los Angeles. Opened in 2011, the venue hosts the New World Symphony’s performances from September to May, including percussion concert series, small ensemble shows, a chamber music series, full-orchestra concerts and other special-themed recitals and events. The center features a main performance hall, a pavilion, a rooftop garden, an atrium, a lounge and an ensemble room. Don’t miss the rooftop gardens, which host many private parties and receptions, and not only feature expansive views of the surrounding South Beach area but also look down into the New World Center Atrium, which is captivating on its own. 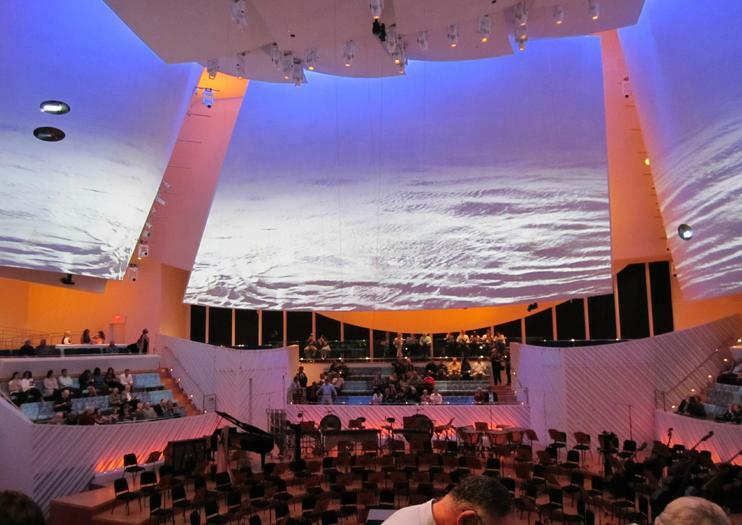 Adjacent to the New World Center is the Miami Beach SoundScape, a 2.5-acre urban multi-purpose space that holds New World Symphony WALLCAST Concerts. Utilizing an impressive mix of visual and audio technology, WALLCAST concerts are shown on a 7,000-square-foot projection wall. As part of the Arts in the Parks program, the SoundScape Cinema Series at ExoStage shows movies on Wednesday nights; concerts and movies are free to the public and do not require a ticket. Docents lead 30 to 45-minute guided tours several days a week: Tuesday and Thursday at 4pm, and Friday and Saturday at noon. The New World Center is located at 500 17th Street in Miami Beach. Experience the lively culture of the bustling South Beach neighborhood of Miami on this guided, 4-hour arts and culinary tour. Listen to renowned young musicians at the New World Center concert hall. Peruse contemporary and historical art at the Bass Museum of Art. And visit ArtCenter/South Florida in the popular Lincoln Road Mall, the leader in contemporary visual arts and culture in South Florida. Then enjoy a delicious 3-course meal, prepared by a celebrity chef at one of the many fine South Beach restaurants.